"My son and I were canoeing around the islands at Charleston Lake Provincial Park," said Andre Campeau, "when we came up to this northern water snake basking in the morning sun." Andre used a Nikon D70 with a 55-200 Sigma zoom at ISO 200 to capture this wonderful grab shot. We got almost within arm reach. Didn't get any closer though. Like you said, we didn't want it in our canoe. That's a great shot! Right now, I'm in Virginia. 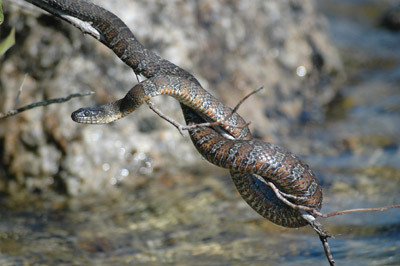 I actually got to see a snake in the lake while Andie (my cousin) Hillary, and I were fishing. It was black with a red belly. She thought it was a Cottonmouth, but we're not really sure. Anyways, that's an incredible shot!